Image by Anders Sandberg via Creative Commons/Flickr. The Stranger has an article this week by Tobias Coughlin-Bogue: “Mugged at Gunpoint on Beacon Hill.” In the article, Coughlin-Bogue describes being robbed twice on North Beacon Hill, and his thoughts on revenge and gun ownership. Have you been mugged on the Hill? Do you feel the police response was adequate? And what do you do to stay safe when walking around? KOMONews.com reports that an armed and mustachioed robber confronted a Beacon Hill store owner Sunday night, but didn’t get the cash he was after. The owner of the store in the 4500 block of 15th Avenue South left the store and told the robber to “take it all,” but the robber left without the loot as the owner watched from outside. Beacon Hill and the Rainier Valley are seeing a wave of jewelry robberies, say Seattle Police. In just over a week, there have been more than 20 incidents of these robberies on streets, at bus stops, and at stores in Southeast Seattle. According to police, the suspects typically either grab people from behind, or walk up to them, ask a question, and then grab the victims’ jewelry and purses. Police believe the series of robberies began on August 14, when two suspects robbed a woman on Beacon Hill after she left a local market. 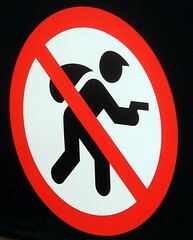 “I was robbed last week, and a shoulder bag was taken from me. It happened mid-morning, on Beacon Avenue near the golf course. It was two young African-American men; they came up behind me, grabbed the bag, and ran. I reported it to the police, but I wonder how many people this has happened to who didn’t report it. If you have any information about these crimes, please contact the SPD Robbery Unit at (206) 684-5535. A burglary turned home invasion left a 70-year-old man with cuts to his wrist, according to police. It happened Friday, around 1:30p.m., near 12th Avenue S. and S. Nevada Street. The victim told police he heard noises coming from the back of the house. When he went to check it out he found the two men inside. The victim tried to fight the suspects off but they pulled out a knife. He told KOMO News they used a telephone cord to tie his hands and feet together and left him in a bedroom while they went through the home. Nearly 30 minutes later the victim’s granddaughter came home and found him. She called 911. The man was treated at the scene for cuts to his hands. An iPad, jewelry and money were reportedly stolen from the home. Three people have been arrested for allegedly macing, then robbing a 12-year-old girl in Beacon Hill Monday. The girl was walking near 25th Avenue South and South Dawson Street around 2:45 p.m. when a group of three people in a car drove past her and pulled up on the street, Seattle police said. As the girl walked toward the car, a man and woman got out, asking for directions to nearby South Brandon Street. The girl complied, but as she started to walk off, one of the suspects sprayed the girl in the back of the head with mace. Then they grabbed the girl’s backpack, knocked her to the ground, and demanded she give over her cell phone. The attackers then jumped back into the car and sped away. The victim wasn’t seriously hurt. However, several witnesses called 911 and officers found the car near 46th Avenue South and South Othello and arrested the three people inside. Taken into custody were a 20- and 22-year-old man and a 19-year-old woman. All three were booked into the King County Jail for investigation of robbery. Once at the jail, the woman set off a metal detector, and officers found she had hidden a can of mace inside her bra, police said. The Seattle Police Department’s SPD Blotter blog reports that a suspect has been arrested in a recent series of street robberies on Beacon Hill. The suspects in the robberies were described as two Asian males and one Black male, all possibly teenagers. The Blotter says, “Information developed during the on going investigation led detectives to the identity of one possible suspect. Victims were able to point out the suspect in at least three of the robberies during a photo line up.” Yesterday, the 17-year-old suspect was taken into custody and booked into the Youth Services Center for investigation of the robbery charge. At 7:30 tonight at the Beacon Hill library, I was unlocking my bike while—I found out later—in the children’s section, a young man pulled on a ski mask and snatched an elderly woman’s purse. He burst out the main doors behind me and ran northeast across Beacon Ave. Several of us chased him and at 18th and McClellan his ski mask and the purse were recovered. The young man got away, but witnesses returned to the library to offer descriptions to the police officer called in by the library staff. The purse was returned to the owner and her ID was still inside, but all of her cash was gone. found the missing cash on him. Thanks to everyone that spoke with SPD regarding the incident—especially the neighbor who happened to notice someone acting oddly on their street. I, for one, will recall this time less as a tragedy and more as a positive experience that really brought out the best in our community, including caring neighbors and a responsive police department. Together we can proclaim that this is our community, and when you’re on Beacon Hill you will be cared for. Katrina noted a dark teal Toyota Corolla being driven recklessly at high speeds around the neighborhood near 20th and Brandon recently. Sometime overnight on the 26th, Mike’s white 1997 Subaru station wagon was stolen from where it was parked on 13th and Judkins. Sunday evening, Mahalie and others along Cheasty had a suspicious visit from a supposed door-to-door magazine salesman. Lindsay mentioned seeing a man driving slowly through the neighborhood near 15th and Dawson on Sunday in a tan Crown Victoria-like sedan, taking photos of houses. Willie wondered if he saw the same guy near 20th and Hanford the same night. Hazel mentioned a neighbor’s property on 20th between Hinds and Spokane had been broken into on Sunday. Maryann responded that she’d seen a couple of kids in baggy clothing acting shifty as she walked along 19th near Spokane Street around 5 or 6pm that night. Houses being cased near 13th and Walker. A burglary near Columbia Drive and South Pearl Street. A forced-entry robbery with weapons at 24th and Graham, with a K-9 unit responding and Graham Street east and west of Beacon Avenue being closed for the search. A broken window and signs of entry near 20th and Ferdinand.